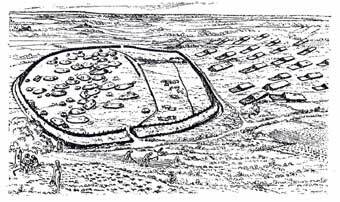 Predecessor of the city  the fortified village. Here is shown an attempt to reconstruct a village during the early Stone Age. Inside the walls, at the left, are houses with small storage sheds; at right, the pastures for cattle. The buildings outside the perimeter are barns.